It's not the shoes. 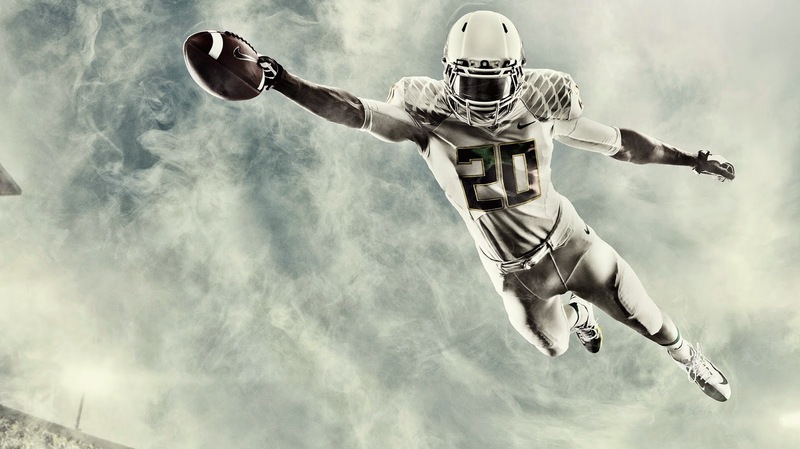 Oregon wears the latest and greatest from Nike, but it's not the shoes or the metal looking duck wings on their shoulder pads. They have just recruited much faster players than other teams and put them in positions to use that speed for ill gains as evidenced during the 2nd half of the Michigan State game this past weekend. Yowza. Michigan State looked pretty solid and there was a point that I really thought they had Oregon figured out. But there is just no figuring for speed in space. Any single crack was exploited. That's why Oregon plays so fast between snaps, they try to minimize down time which will inevitably increase the total number of snaps in a given game thus giving them more opportunities to find and exploit those cracks. Other than that game and USC narrowly edging Stanford though there were a lot of cupcakes this weekend. But that's fairly typical for Weeks 1 and 2. We start to get into the meat of the season next week with Rutgers kicking off their B1G Ten schedule hosting Penn State at 8pm. Be there. chronometer Replica watches UK testing center(Independent non-profit organization) 15 days and nights rigorous testing.“When the Rolex Daytona official identification of authorized account” to get the precious honor vouchers, watches must Replica Watches operate under extreme precision and temperature at different locations. This is also consistent standard Replica handbags chronometer’s.This self-winding structure is equipped with an handbag replica automatic thallium.